Mangroomer has a line of men’s personal care products that have earned recognition in the consumer market for their unique way to solve a man’s hairy problems. The Mangroomer Ultimate Pro Back Shaver looks a lot like an electric shaver, but with upgrades to make it better to shave a hairy back. Many men have hairy bodies and they like to shave the hair off, particularly for the summertime. Often a special event or date is coming up too, so they want to look their best. Some women also have hair on their backs, and they want to get rid of it for every day of the week. In the past, there have been many solutions for getting rid of back hair: shaving it off with tiny disposable razors, trying to get an electric shaver around your back, going to a salon to get it waxed off, or asking someone to do it for you, which is embarrassing. 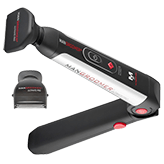 Both men and women can use the Mangroomer Ultimate Pro. It’s a cordless shaver that has a long black body with flattened power head combs to shave hair, and the MANGROOMER logo featured prominently in a background of white. Besides looking great, there are other benefits to using the Mangroomer Ultimate Pro. When men want to keep their backs smooth and free of hair they will also be benefiting from feeling cooler. Also, there is no hair to trap bacteria which can cause body odour. You can also use it to trim hair off your chest or other parts of your body, as it’ll still do an effective shaving of those areas too. The Mangroomer Ultimate Pro differs from using disposable or safety razor blades though. It has a long handle that folds out, to allow you to extend your reach so you can shave every region of your back. 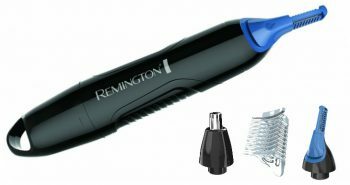 There is also an expandable handle that pushes out to make the shaver even longer. It can be locked into place with the pressing of a red switch called the Pro Excel extension lock button. 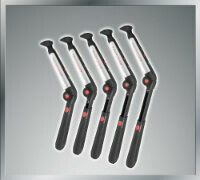 You can also choose at what length you want this end handle to lock into, so you can customize it to your body’s needs. The handle has a hexagonal design, made in black and is rubberized, so you can more easily grip it in your hands. 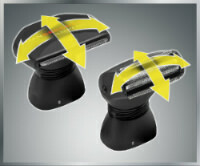 You also have the ability to choose the angle that you want your shaver to be at. This can also be locked in with the power hinge easy push lock button. You have the choice of angles from zero to one hundred and thirty-five degrees. The Mangroomer Ultimate Pro has created this shaver with a patented design that enables a man to reach all regions of the back with ease. Hair will be quickly and cleanly shaved off. 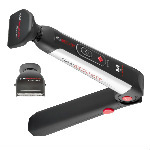 It took Mangroomer about ten years to do the research and development for the Mangroomer Ultimate Pro Back Shaver. 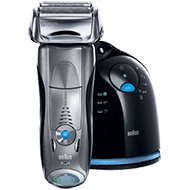 There is a black on/off button on the front of the shaver, and a square red button that provides a power burst so you can have more shaving power for those difficult to reach areas. The power burst also works well for hair that is extra thick or coarse. 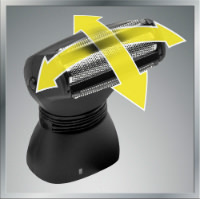 Right under the “M” on the front of the shaver is an LED button. It will light up in green to tell you that there is plenty of power to shave, or it will light up in red to tell you that you need to plug it in for charging. The Mangroomer Ultimate Pro actually comes with two different shaving heads, depending on your needs. One of the shaving heads is a 1.8 inch ultra wide back groomer blade which will help you to shave larger regions of your skin, and shave off longer hairs more quickly. There is also a foil bi-directional head which is perfect for regular maintenance, such as shaving off shorter hairs on a weekly basis. It will also provide you with a smoother shave. Both of these heads are flexible, so that they move backward or forward, or to the left or the right. This eases the shaving experience, so men don’t have to force the shaver to where it needs to go. 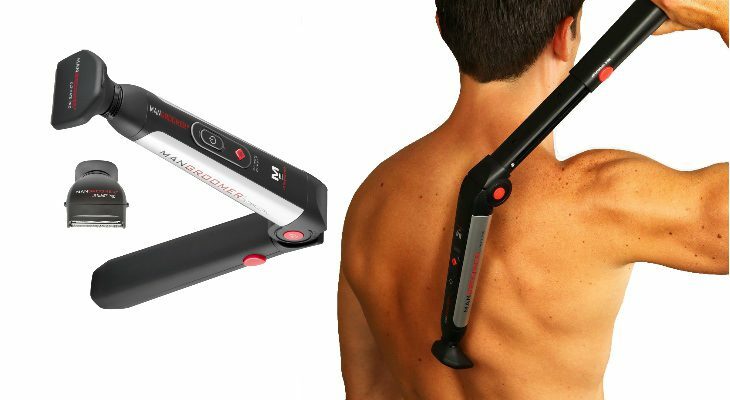 There will be perfect blade to skin contact as the shaver head follows the contours of your back. These flexible necks are also built with shock absorbers, so shaving is quieter and more pleasant. The shaving heads contain sharp blades that are made from stainless steel, so they are considered hypo-allergenic. This will give you a smooth and non-irritating shave. It’s also beneficial to people who may be allergic to nickel, so they can avoid that metal if they purchase the Mangroomer. The Mangroomer Ultimate Pro Back Shaver is fully rechargeable. It recharges quickly and easily. All of the benefits of the Mangroomer Ultimate Pro will make it an easy purchase decision for you. After using it, you’ll feel and look clean and well-groomed. Your image will be positive to others. You’ll gain confidence, knowing that you look your best, and no one will be staring at your back or laughing at you. You can surprise your partner with your groomed appearance. Perhaps you’ll get some back massages out of it! Shaving your back will also display all that hard work you have done to get your muscles buff and toned. You’ll also have less sweat accumulate on your back as it will have nowhere to hang on. 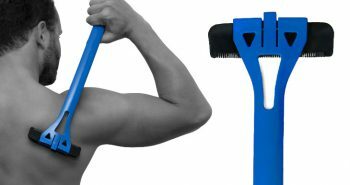 The Mangroomer costs around $50, which may seem a bit steep for just one grooming tool that only shaves backs, but you’ll have it for a long time. 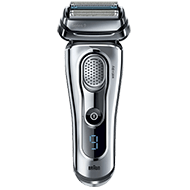 In the packaging you’ll receive one Mangroomer Ultimate Pro back shaver, a second bonus-bi-directional attachment head, a recharging power adaptor, a cleaning brush, and an instruction manual. 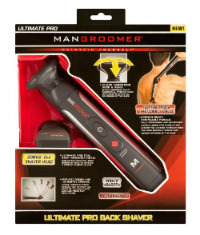 The Mangroomer Ultimate Pro back shaver will be your summer essential tool. You can use it before the pool or beach party, or before an afternoon of working out. You can even pack it for a trip to a tropical island.